Nannerth Country Holidays01597 811121work Self-cateringDelightful cottages with hot tubs in spectacular "Kite" countryside on working hill farm with its own private nature reserve. Peaceful location yet lots to do. Walk, birdwatch or cycle from your door. See daily farm activities such as lambing or badger watch from our treehouse. Friendly animals, wildlife trail through conservation areas, play area, fishing. Farm bikes are available to borrow and wildcamping available. Wetroom. Hands on falconry sessions with Hawksdrift, successful on Dragons' Den. We have solar hot water and woodchip central heating installed. Delightful cottages with hot tubs in spectacular "Kite" countryside on working hill farm with its own private nature reserve. Peaceful location yet lots to do. Walk, birdwatch or cycle from your door. See daily farm activities such as lambing or badger watch from our treehouse. Friendly animals, wildlife trail through conservation areas, play area, fishing. Farm bikes are available to borrow and wildcamping available. Wetroom. Hands on falconry sessions with Hawksdrift, successful on Dragons' Den. We have solar hot water and woodchip central heating installed. 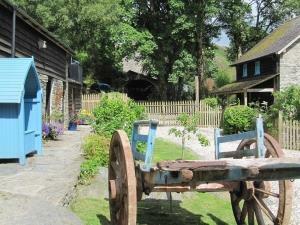 This is a traditional working farm, with animals living freely and 200 acres of wonderful countryside to explore. Children must be supervised at all times by a responsible adult. Children welcome from any age. From Rhayader B4518 going west - at outskirts turn right onto the "Aberystwyth Mountain Road" where there is also a brown 'Nannerth' sign and continue for 0.5 mile. Turn right onto unclassified council road, also with brown 'Nannerth' sign. Follow for 2.75 miles. Do not turn off the tarmac road. Farm at top of long straight hill. Avoid using satnav for last few miles or you will get lost!